There are many reasons why foreigners decide to move to Thailand, the land of smiles - the tropical weather, the exotic culture, the paradise-like islands and beaches, the delicious food and friendly Thai people. Bangkok or known in Thai as Krung Thep Maha Nakhon, meaning "City of Angels",is the capital of Thailand. Bangkok is the economic center of Thailand, dominating the country's economy and dwarfing any other urban centers. Development continues to pour in to Bangkok mostly neglecting the rest of the nation. How do foreigners get the professional lawyer in Bangkok? M & S Law Office 2006 is a leading law firm in Bangkok founded on strong client-relationships and an international reputation for excellence. Our Bangkok law firm located on Suthisarn Road. So you can take MRT and get off at Suthisan Station and then go to Soi Pibul Uppatham by Taxi. Click contact us to get our bangkok law firm map. Our Thai and Foreign lawyers are professional in Thailand Law and Good communication in English. Our professional lawyers provide Thailand legal services in business, civil, criminal, property, employment and labor. 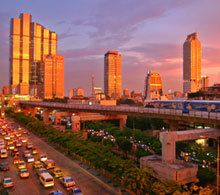 Real Estate in Bangkok is booming and has all increased in value over the last few years. Our Bangkok lawyers provide property legal services for leading the foreigners who decide to purchase property such as condominium in Bangkok to successful in property transaction. The civil litigation in Bangkok, assists clients in prosecuting claims on their behalf, as well as defending clients from claims brought against them, at both the trial in the court of first instance and appellate court throughout Bangkok. Our Bangkok lawyers also have deep experience with all forms of alternative dispute resolution (ADR) from mediation and other arbitration to more specialized formats to achieve success for the client through civil litigation in Bangkok. The Criminal Litigation of Bangkok is serious case. If you have been charged with a criminal offence. How to protect your rights and freedom in Bangkok. Our lawyers provide full range of services in criminal such as drug crime and murder. Let’s professional lawyer in Bangkok help you! Our Bangkok lawyers have detailed knowledge of the employment laws of Thailand. Our employment and labor lawyers are frequently engaged by foreign nationals and companies in Bangkok to resolve employment disputes concerning international teachers, corporate managers and senior corporate executives. WHY SHOULD YOU FIND A GOOD LAWYER TO ASSIST YOU IN THAILAND? As all statements in Court need to be submitted in Thai. Unless fluent in both written and spoken Thai, it is advisable for a foreigner to instruct a lawyer in Thailand to act on his/her behalf. As a result, M & S Law Office 20006 offers all methods of communication to our clients and we do our best to answer client queries on the same day. We do our best to represent you and to keep you informed the progress of the case. We make the effort to tell you, (either by phone, email, fax or letter) every time a step is taken. If things are held up for any reason, we will tell you why. We also make sure that all our communications are in plain clear English. Let us help you by calling us at (+66)2 693-2036 or send email to contact@mslaw2006.com or send us enquiry. Links on News & Media - FreeDirectorySubmit.com, a Social-aware, SEO-friendly web directory submission service.